Inspired by History, Designed for You! 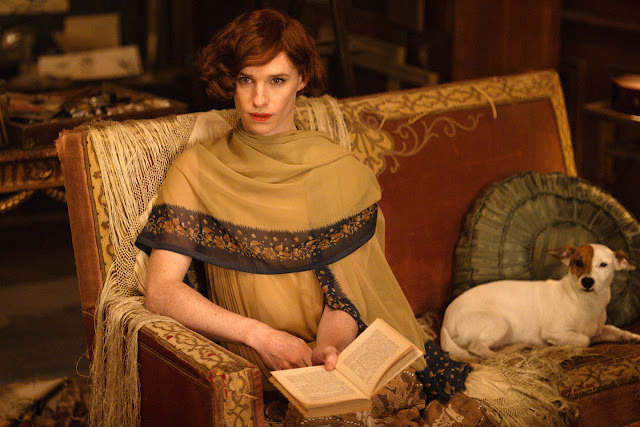 The Countess Bodice sounds awfully fancy and it can be. Dressed up or dressed down, it really is the most versatile, practical bodice you can buy. 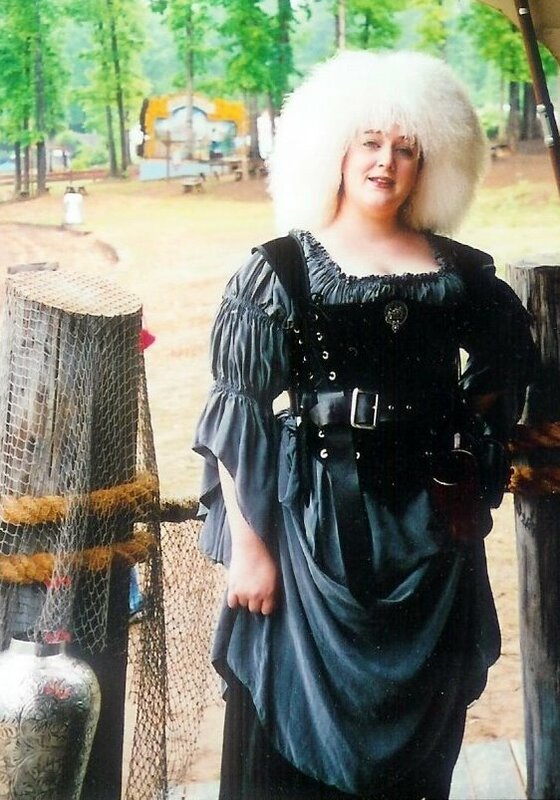 The idea for this bodice started way back in 2001 while I was still travelling with a company called The Pirate's Treasure selling swords at Renaissance Festivals. I wore bodices a LOT, and of course made my own. 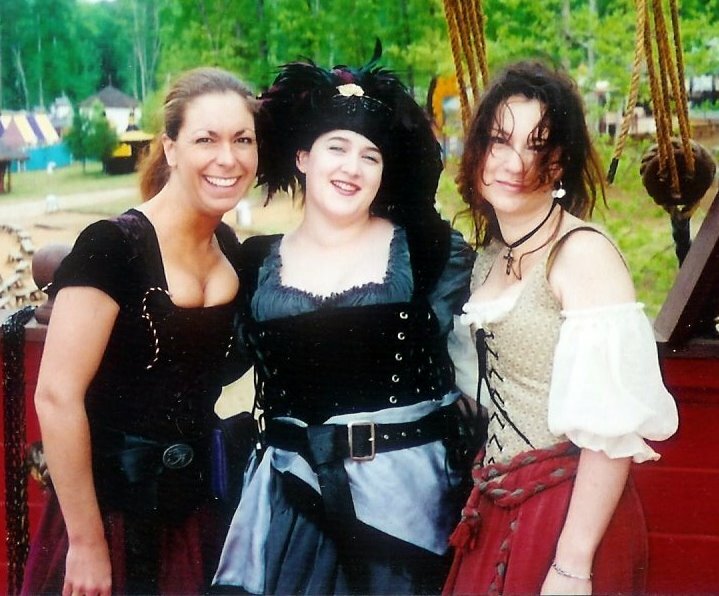 I usually wore the Goddess Bodice, because it was so darned comfy for those very long faire days. One problem, it laces in the back. The more we travelled, the harder it was to find someone to lace me in properly. 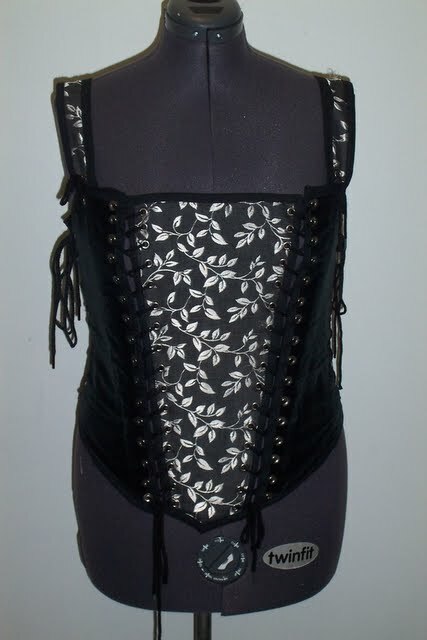 The front laced bodices I was making at the time were too hard on my back, especially during long work days. That was before I figured out the Ducktail. So the goal with this style was to have a goddess style bodice that I could lace up myself. I didn't just want to put front-middle laces, because that would just be a front laced bodice. I'll probably do that with a different bodice. Anyways, I also had the idea that I could make replacement stomachers (the middle piece that forms a V in the front) in various fabrics to go with my outfit. I never got around to that with this bodice as I was just testing it for comfort and overall style. To the right was my first ever attempt. I made it out of black velvet and from what I can tell looking at pictures, I loved this bodice! It had several flaws, which is why the prototype is so important so I can test it in the field myself. Shoulder straps attached to the bodice front through the lacing holes. I still think that was ingenius. Unfortunately, it made the shoulders set too wide, which made them fall off my shoulders. That also made the neckline too wide, so it made cleavage less contained and shapely. It also made the lacing process more ungainly. The bodice wouldn't stay on straight until I got it fully laced because I lace bottom to top. The shoulder straps themselves were too wide. I prefer a narrower strap and add on caps if I want them. Back laced, side laced, and front stomacher laced. This added to the adjustability, and I was able to get dressed myself and not have people mad at me. The two sets of laces on side and side/front were very close together. The fabric separating them was almost non-existant. A bit awkward to lace because it goes up on an exaggerated angle, not straight, so getting the bodice laced on and properly set was difficult. Our second prototype worked much better. You can see it there to the right. The stomacher is narrower, shoulders are narrower and both are reversible. This was a fabulous bodice, but was too short in the back and the boning dug into me, which is now why I'm VERY careful about back boning being positioned correctly. When it's in the right place, it's fantastic. When it's not, it's brutal. I also used 00 grommets, which are smaller than our standard size 0 grommets, on the stomacher. There were too many grommets in general, and so it was basically just a fancy goddess bodice since it was very difficult to swap out the stomacher. That was disappointing, but prototypes aren't expected to be perfect. It did tell me all I needed to know in order to venture to the next stage - A standard pattern. There are other companies who make similar bodices, but the big complaint I hear is that the stomachers are all the same size. So on a small, the proportions are great and look fabulous, but as the sizes get larger, the ratio of stomacher to sides gets more and more exaggerated. That is why our Countess Bodice stomachers change with each size. On to the current incarnation of the Countess bodice. It has now been standardized to fit the measurements of our other bodice styles, but because of the multiple lacing points it is more adjustable. The basic bodice sells with one reversible, replacable stomacher so you get 2 looks in one. 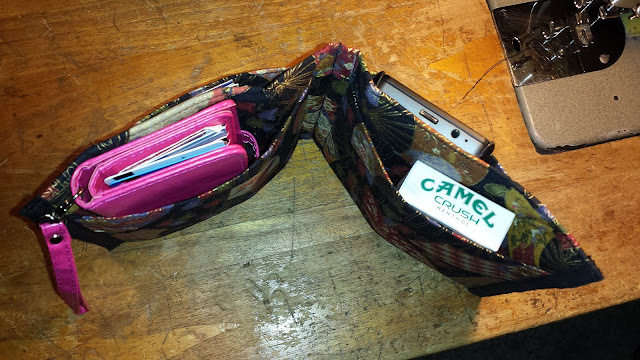 Interchangable, reversible stomachers that change width with each size. Get new stomacher and shoulder strap sets or flip them over for a whole new look without buying a new bodice. Weight change that made your bodice too big or too small? Get a stomacher in a smaller or larger size than the actual bodice and cheat the fit without having to invest in a whole new bodice. Just had a baby? Order the size you will be once you lose the baby weight in the bodice itself, then get a stomacher set one size up. Email us if you need help choosing this option. Speaking of babies, this will also be the most discreet and comfortable for breast feeding, since you can just release the side you need. When traveling, just pack one bodice with a stomacher/shoulder strap set or two. More variety in a smaller space! Size 0 grommets, the same as on the rest of our bodices. No need to worry about swapping out stomachers and shoulder straps. The holes are plenty big and spaced for optimal lacing. Switch them out quickly. Standardized punching charts allow all standard stomachers/shoulder straps to fit on bodices, no matter what size. Get laced in from the back or the front. It's your choice. No more having to run around finding someone to lace you up. Lots of lacing points for ultimate adjustability. Feeling a little bloated? Not a problem. Bones on the back closure and on either side of the stomacher. On larger sizes, there are 3 bones on the stomacher itself, on smaller sizes, just two will fit. We only ever use 1/2" wide, flat steel boning. I've tried other types and there's just no comparison in my opinion. We use just enough boning to give you the right shape and allow you to have lots of movement. Sure, we could load up on boning, but how fun is that to wear? For every piece of boning, we ask ourselves if it adds more than it detracts. We can always add more if you really want it. $5 a piece, installed! This is going to be intimidating for some people but I'm just an email or a phone call away if you need some assistance. If you can't tell if the fabric swatches will go together, you can now order swatches to be mailed to you so you can look at them physically.